Why Meningitis That Hit Princeton Is Hard To Beat With Vaccines : Shots - Health News It turns out that the bacteria that are responsible meningitis B have a sugar coating that makes them look a lot like human cells. That similarity makes development of a vaccine against the germs especially tricky. Developing a vaccine for meningitis B was tricky. Even the existing vaccine doesn't protect against all B strains. There's been a lot of talk about meningitis B lately. That's the type responsible for outbreaks at Princeton and the University of California in Santa Barbara. And it got us thinking. How come this form of the illness isn't fazed by the vaccines given routinely to most young people in the U.S.? This week, Princeton is administering an imported vaccine not approved for general use in this country, with special permission from the Food and Drug Administration. The vaccine, called Bexsero, is fairly new. Swiss drug giant Novartis, which manufactures the vaccine, completed clinical trials early last year, and got approval to sell the vaccine in Europe last November. It turns out that the meningitis B bacteria are tricky little things. They have a sugar coating that's very similar to sugars found on the surface of certain cells in the human brain and body. 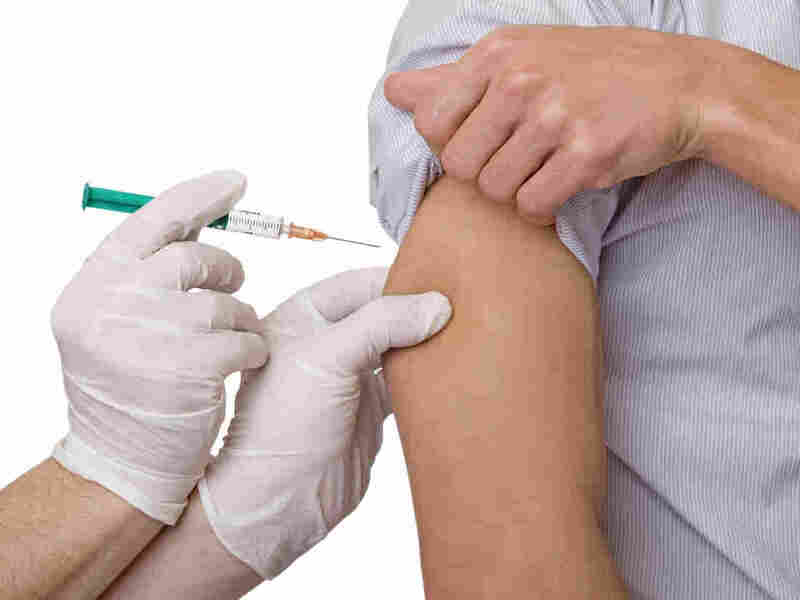 Dr. Walter Orenstein, associate director of Emory University's vaccine center, says this sugar coating complicates the development of an effective meningitis B vaccine. The older, more common vaccine (which protects against strains A, C, W-135 and Y) works by training the body's immune cells to recognize the sugar on the meningitis-causing bacteria as something bad, Orenstein tells Shots. The same approach won't work for the B-type bacteria. When immune cells encounter the meningitis B sugar coating, they're more likely to identify it as belonging to a friend rather than a foe, Orenstein says. They're used to seeing the same sugar all over the human cells. There are ways to teach our immune system that the meningitis B coating is bad, but that could be risky, he says. In the hunt for meningitis bacteria, the immune system could start attacking human cells by mistake. The obvious solution is to train the immune system to recognize meningitis B by some other characteristic. But there are hundreds of strains, and sometimes the only thing they all have in common is that darned sugar coating. Dr. Andrin Oswald, head of Novartis' vaccine and diagnostics unit, says researchers analyzed the genes of hundreds of meningitis B strains before they found a few chemicals that most of the strains seemed to share. "But substrates are different around the globe," Oswald tells Shots. And even within a single country, the meningitis strains can change over time. Even so, some protection is better than none, and Oswald says he hopes the FDA will approve Bexsero for broader use in the U.S. sometime soon. Oswald says the Novartis vaccine protects against at least 70 percent of meningitis B strains — and up to 95 percent of strains in some countries. The most common side effects include fever, sleepiness and pain at the site of injection. So Bexsero's not perfect. But Emory's Orenstein says at the moment the Novartis vaccine seems like the best bet. "I think it's as good as we can get for now," he says. "Certainly if I had a kid at Princeton, I'd want my kid to get the vaccine."